Following on from the success of their Christmas game campaigns over the last few years, Beazley decided it was time to give their staff and customers another festive treat, so they reached out to us. They wanted a game that was addictive and easy to play on all devices and desktops and had a fun competitive edge. We used the conga game engine from our white label range, an addictive game based on the Nokia phone game classic; Snake. Using a proven game platform meant we could get this game off the ground quickly and having agreed illustration styles, game mechanics and obstacles (watch out for those beers, they might make you bit fuzzy an throw you off course!) we were ready to go in 6 weeks. 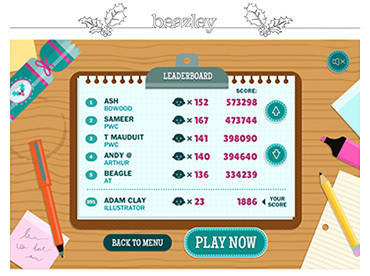 The in-built leader board and social sharing elements kept the competition going throughout December. This game was played nearly 50,000 times in the first 4 weeks, with average play sessions lasting around 12 minutes – that’s one big conga line!